Known for his work in Renaissance literature, intellectual history and the evolution of consciousness, Walter J. Ong, S.J., was a Jesuit, a scholar and a teacher. The Ong Center at Saint Louis University was created in his memory. Walter Jackson Ong was born Nov. 30, 1912, in Kansas City, Missouri. 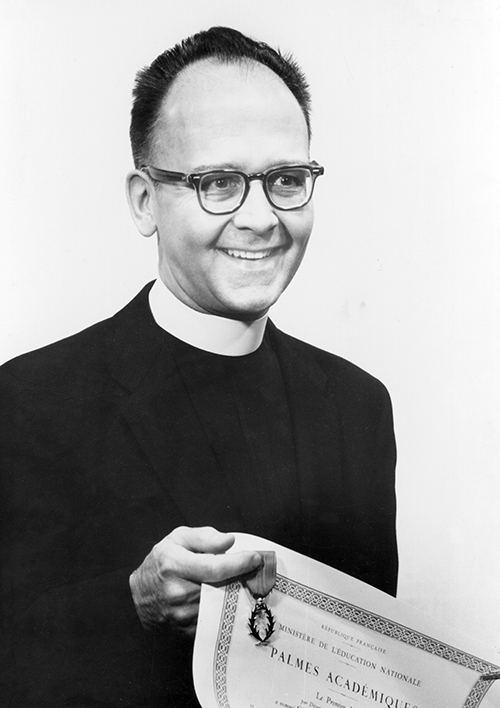 He earned an undergraduate degree from Rockhurst College and worked for two years before entering the Society of Jesus in 1935. 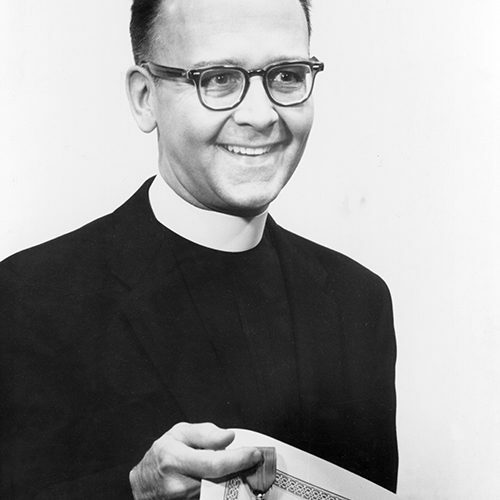 He then studied philosophy and theology at Saint Louis University, receiving his master’s degree in English at SLU. He earned his doctorate at Harvard University before returning to SLU. An author of over 450 publications, Ong was a SLU professor emeritus, the William E. Haren Professor Emeritus of English and Professor Emeritus of Humanities in Psychiatry. His students labeled his courses “Onglish” to explain his vast knowledge of topics in any class. For decades, Ong celebrated daily Mass in St. Francis Xavier College Church. He regularly directed others in the Spiritual Exercises of Saint Ignatius of Loyola and tutored young boys at North House, a former Jesuit residence in St. Louis. SLU was among the many institutions to recognize Ong, bestowing him with the University’s highest honor, the Sword of Ignatius Loyola, in 1993. His seminal work “Orality and Literacy” was translated into a dozen languages, and he gave lecture tours in Western Africa, Japan and across Europe. Ong was active until the end of his life. His last article, “Digitization Ancient and Modern: Beginnings of Writing and Today’s Computers,” published in 1998 in Communication Research Trends, won the Media Ecology Association’s Walter Benjamin Award for Outstanding Article in the Field of Media Ecology in 2000. Ong died in 2003. Many of Ong’s works treat the evolution of conscious as connected with the technological transformations of the word by writing, print and electronics. Others center on religion, literature and culture. Ong’s earliest books on Renaissance intellectual history, “Ramus, Method, and the Decay of Dialogue” (1958) and “Ramus and Talon Inventory” (1958), were the result of four years of research in European universities and libraries. Two of those years were spent on a fellowship from the Guggenheim Foundation of New York. These books served as Ong’s Ph.D. thesis for Harvard and launched his career in academia. A trilogy of books, “The Presence of the Word” (1967), “Rhetoric, Romance, and Technology” (1971) and “Interfaces of the Word” (1977), trace the alienation and reintegration of consciousness brought about through technological transformations of the word by writing, print and electronics, and the effects of the transformations on oral tradition and literary forms, thought processes and social structures and behavior. These books form the foundation for most contemporary Ong scholarship. “Orality and Literacy: The Technologizing of the Word” (1982) reviews revolutionary new work on orality-literacy contrasts from ancient through present cultures, with attention to implications for structuralism, deconstruction, speech-act and reader-response theory, the teaching of reading and writing skills to men and women, social studies, biblical studies, philosophy and cultural history. Two books by Ong, “In the Human Grain” (1967) and “The Barbarian Within” (1962), are critical explorations of literature, contemporary culture, and religion. A briefer book, “Why Talk” (1973), presents a nontechnical discussion of the nature and history of language. “Fighting for Life: Contest, Sexuality, and Consciousness” (1981), treats the functions of contest in human life, from sports through classroom teaching and political rhetoric, with reference to contest in infra-human animal existence, providing new insights into the complex biological settings of human intellectual and cultural activity, sexual differences, and the human quest for freedom. “Hopkins, the Self, and God” (1986) is a historical study of the nineteenth-century English Jesuit poet Gerard Manley Hopkins, whose intense preoccupation with “inscape,” the particular individuality of each individual existent, and especially with the most particular of particulars, the human self, was powered by both Victorian and recent Catholic concerns that aligned Hopkins with modem and postmodern poetry even before these movements were well under way. This book concerning Hopkins’ profound thinking about the self is relevant to today’s widespread studies on the origins and operation of human consciousness. Two of Ong’s books treat the problems of contemporary human beings and society in relation to the American Catholic tradition: “Frontiers in American Catholicism” (1957) and “American Catholic Crossroads” (1959). He contributed to and edited “Darwin’s Vision and Christian Perspectives” (1960) as well as “Knowledge and the Future of Man” (1968). The four-volume “Faith and Contexts” (1992-1995, 1999) and “The Ong Reader” (2002) include selections of Ong’s essays and studies. Both are edited by Thomas J. Farrell and Paul A. Soukup. Ong was a member of the National Council on the Humanities from 1968-74, including serving as a vice chair. He served on the White House Task Force on Education in 1967, served on the advisory board of the John Simon Guggenheim Memorial Foundation, was co-chairman of the National Endowment for the Humanities’ Committee on Science, Technology, and Human Values, and was chairman of the Board and president of the National Humanities Faculty. He served on the National Commission on the Humanities (1978-80) sponsored by the Rockefeller Foundation. He was a member of the Renaissance Society of America, the Modern Language Association of America (President, 1978), the Modern Humanities Research Association, the American Catholic Commission on Intellectual and Cultural Affairs, the Cambridge (England) Bibliographical Society, etc. The French government named him Chevalier dans l’Ordre des Palmes Academiques. He also served as a member of the editorial boards of various periodicals, as regional associate for the American Council of Learned Societies, president of the Central Renaissance Conference and of the Milton Society of America, member of various national committees of the Modem Language Association, the National Endowment for the Humanities, and the American Council on Education. Ong presented papers or served as resource person or seminar leader at the Center for the Study of Democratic Institutions, the Aspen Institute for Humanistic Studies, the Wenner-Gren Conference Center for Anthropological Research at Burg Wartenstein, Austria, the 1968 World Student Christian Federation Conference in Turku, the Star Seminar of the Graphic Institute in Stockholm, and other conferences. He was a fellow of the American Academy of Arts and Sciences, as well. Well known as a speaker across the United States and Canada and on national radio and television networks in the United States and abroad, Ong lectured widely in Europe, particularly to university and other groups in Paris, Bordeaux, Toulouse, and at the Centre d’Etudes Superieures de la Renaissance at Tours (University of Poitiers), as well as in the Middle East, Central and West Africa, North Africa, East Asia and Latin America. He lectured at the Georgetown Conference on the New Criticism and the Michigan State University Conference in Modern Literature. Ong served as McDonald Lecturer at McGill University, Terry Lecturer at Yale University, Messenger Lecturer at Cornell University, Alexander Lecturer at the University of Toronto, Wolfson College Lecturer at Oxford University, Visiting Professor of English at the University of California, Fellow of the School of Letters at Indiana University, Berg Professor of English at New York University, Visiting Willett Professor in the Humanities at the University of Chicago, National Phi Beta Kappa Visiting Scholar for 1969-70, and Lincoln Lecturer abroad for the Board of Foreign Scholarships 1974. Rev. 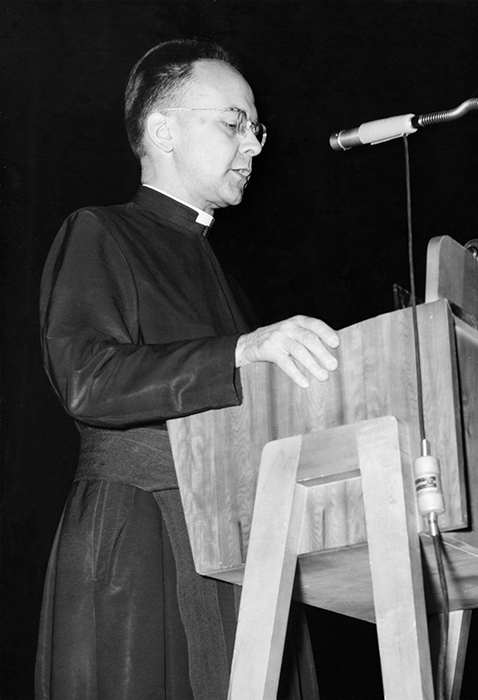 Walter J. Ong, SJ, receiving award in the Knights' Room of Pius XII Memorial Library. (22 February 1963) Photographer Rev. B. T. Lukaszewski, SJ.